If you ever tasted and savored a real Cubano (Cuban) sandwich, then you know the real deal. It’s a sandwich made with roasted pork, ham, Swiss cheese, pickles, mustard, and depending when you get it, sometimes salami on warm Cuban bread. After it’s assembled, it is then placed on a “plancha” (flat plate; similar to a panini press) and heated til the cheese is hot and melted. Do you know what’s not included in the original Cubano? 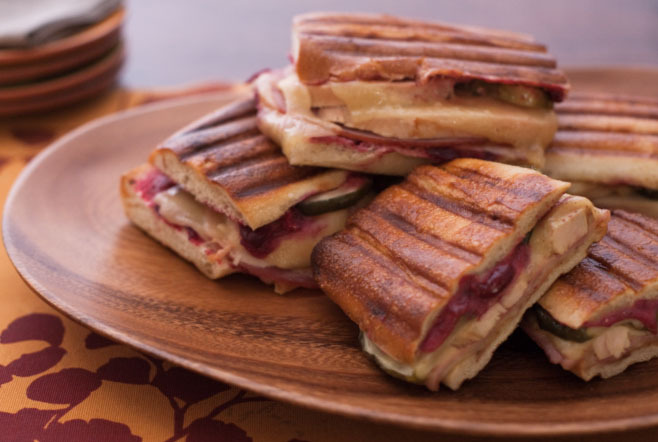 You will not find mayo in any Cuban sandwich but Bobby Flay takes it to the next level. Although the Cubano is tasty as-is, Bobby Flay’s version is just as good. 1. Whisk Hellmann’s® or Best Foods® Dijonnaise ™ Creamy Dijon Mustard with cranberry relish in small bowl; season with salt and pepper. 2. Arrange bread on flat surface, then evenly spread with Dijonnaise mixture. Evenly top 2 of the bread slices with 2 slices cheese, ham, turkey, remaining cheese and pickles. Top with remaining bread, Dijonnaise-side-down. 3. Spread 1 tablespoon Hellmann’s® or Best Foods® Real Mayonnaise on top of each sandwich and cook in medium skillet over medium heat or in panini press, Mayonnaise-side down. Arrange brick* on sandwiches in skillet and cook 2 minutes or until the bottoms are golden brown. Remove brick, then evenly spread tops of sandwiches with remaining 2 tablespoons Mayonnaise; turn over. Arrange brick on sandwiches and cook an additional 2 minutes or until bottoms are golden brown and cheese is melted. Cut in half and serve warm. *Wrap brick in heavy-duty aluminum foil to use as a press. Stay tuned for two more fantastic and tasty sandwich recipes from Bobby Flay! *Thanks to Hellmann’s for providing the photo.